"AND THE BEDLAM BROKE LOOSE"
The ancient beast known as OUTRAGE has reared its ugly head again. Influenced by their peers from the early days, they stick to their style which they've developed over the years, not caring for any new trends, and after almost 35 years they still remain Germany's best kept secret. That's why OUTRAGE are no retro band - they are simply an old band who still know how to thrash like it's 1984. Their 8th full-length brings 12 new compositions and one track which they wrote in 1982 (so one year before the band actually got its name) - and the best thing is it's not easy to tell which one it is. If you are a serious fan of the first wave of black metal and '80s evil thrash, and if you worship bands like SODOM, old CELTIC FROST, HELLHAMMER, VENOM, POISON, POSSESSED, BULLDOZER or FLAMES, this album is absolutely essential! It all began on the 7th of May 1983 in Pforzheim (South Germany), when Udo F. "The Bringer of Doom" (lead guitar) and Frank P. "The Voice of Hell" (lead vocals) started OUTRAGE after just a couple of meetings. Their influences were HELLHAMMER, CELTIC FROST, METALLICA, SLAYER and especially VENOM. Udo started writing all the music, making arrangements and he gave the band's lyrics a deeper meaning. He also gave their band its name. Some months later Martin K. created the OUTRAGE logo. After the band had put an announcement in the local papers, the drummer Andreas E. joined the band in July 1983. In January 1985 Roland S. (bass guitar) came to the band, but left after a year. Unfortunately Roland died in an accident some years later. In February 1987 he was replaced by Reini W.
The rehearsals started in October 1984. It did not take long for OUTRAGE to find their very own sound and their own way of playing and performing. It was especially Frank "The Voice of Hell" who had his personal style of singing which made the band kind of unique from the start. It was also Frank's special performing and masquerade that shaped the band. With their raw and brutal sound OUTRAGE became part of the first wave of Black Metal. The first concert was played in July 1985. Several gigs followed, including one with POISON ASP and German DEFENDER, then death-thrashers POISON and later on, in July 1986, a very special one with KREATOR and TANKARD. In December 1986 OUTRAGE shared the stage with the Swiss thrash act MESSIAH. Meanwhile, in September 1985 OUTRAGE recorded their first demo, followed by the second one in December the same year. April 1986 saw the release of the band's third demo tape "From Nightmares and Myths", on which Udo played also bass. After Reini joined the band, the fourth demo titled "The Book of the Seven Seals" was recorded in July 1987. In January 1988 OUTRAGE supported DARKNESS and it turned out to be the band's last gig in the '80s. Then everything changed: Andreas, Frank and Udo were in the army, far away from their hometowns. The band's rehearsals suddenly stopped and there was no chance for them to meet for a long time to come. In July 1988 the band officially split up. 16 years later, in March 2004 OUTRAGE was reborn. Udo "The Bringer of Doom" was approached by a young bass player Kevin L. (member of HEILIGS BLECHLE) and asked if he'd consider reforming the band. He later brought in a drummer, Alex G. and on the 20th of April 2004 Frank "The Voice of Hell" returned to OUTRAGE. The rehearsals and started again. The first CD "Back for Attack" was released in October 2004. It contained all old songs except for the title track. Again several concerts followed - gigs with local bands around their hometowns, as well as shows hundreds of kilometers away with bands such as WARHAMMER and GODDESS OF DESIRE. In June 2005 "A Mute Reminder" was released. It contained some old and some new material. Another full-length, "7 Is 1 Take One" as well as "Tales of Counted Sorrows" EP, which was a concept album, followed in the year of 2006. Volker "Iron Lung" of WARHAMMER was a guest vocalist on the EP - he sang the song "Killer" together with Frank. Before the recording of "Tales of Counted Sorrows", in May 2006 Kevin left the band. Johannes E. entered the band, but was not ready to record the new songs yet, so a studio bassist, Mark B. was hired. Eventually, in December 2006, the bass duties were taken by Stefan L., who had attended all the OUTRAGE concerts and had been a real fan since the reunion in 2004. 2007 was the year with the most concerts played in the history of the band. OUTRAGE shared the stage with WARHAMMER, MINOTAUR, DECISION TO HATE, NEFARIOUS, DELIRIUM TREMENS, NOCTURNAL, HELLISH CROSSFIRE, HATCHERY and others. OUTRAGE started rehearsing the songs for the next album "Order in the Court" and had the studio booked. Then in January 2008 the biggest shock happened: Frank P. "The Voice of Hell" suddenly left the band. Nobody saw it coming, as it was because of his personal life reasons, not related to the band. When Alex and Stefan brought their friend Frank S. (vocalist of NEFARIOUS) to the rehearsal and he started singing, the band declared him their "savior". In no time had Frank S. learned all the lyrics and the band went to the studio. On the 7th of May 2008 OUTRAGE celebrated their 25th anniversary. Right in time, the anniversary CD "Order in the Court", the DVD "Arrival at 7.11"(containing studio footage and fragments of various shows, and a bonus CD with 2 previously unreleased tracks) as well as the fanzine-style book "OUTRAGE - The Complete Story" were released. In 2008 the band played with WARHAMMER and DECISION TO HATE again. Then in November the same year Alex, the drummer left the band. One month later Yannick A. (GEFRIERBRAND) took his place behind the drum kit and in September 2009 Mario S., rhythm guitar, joined OUTRAGE. The 5th album, "Conspirator" was the first digitally recorded CD and it was planned to be the last OUTRAGE CD. It was released in October 2010. In December 2010 OUTRAGE planned to call it quits. Most of the members of the band were not so interested in playing in the band anymore. Udo F. wanted to continue playing though, mostly the old OUTRAGE songs, and he had plans to team up with Frank P. again, however starting a brand new project under a different name. The last OUTRAGE concert was scheduled for February 26th 2011. Many fans came from near and far to see the band for the last time... On this special evening Frank P. "The Voice of Hell" came on stage to sing a few songs too. However the band's plans to call it a day were spoiled soon before that show. Jowita from Metal On Metal Records had contacted Udo to order the whole OUTRAGE discography (having had only "From Nightmares and Myths" demo since the end of '90s). What started as a "fan-band" contact very quickly developed into a "label-band" relationship. On the morning before the last concert, Metal On Metal Records sent an offer to the band and it was soon a done deal. And so, OUTRAGE did not quit... Frank "The Voice of Hell" returned, joining again Udo "The Bringer of Doom" and Yannick "The Holder of Chaos". 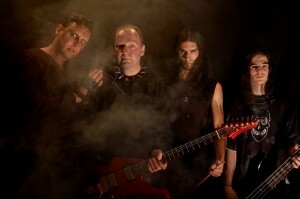 In February 2011 Torsten M. "The Son of Death" (Yannick's band mate from GEFRIERBRAND) entered the band as the new bass player... and so the new line-up was created. The band started intense rehearsals again, preparing to enter the studio in order to record their 6th full-length and 1st one to be released through a label. They decided to re-record a selection of songs from their early days and call he album "Go to Hell", after the 1st song on their 1st demo from 1985. The recording started on May 7th, which is precisely (!) 28 years after the band's inception. They have remained true to their roots and old school way of recording: live drums recording, old guitar equipment (original distortion effect and Marshall amp, as well as the guitar itself from the early '80s), no modern day techniques. "Go to Hell" saw the light of day on October 28th 2011 and is a throwback to the band's dark past... On the same day a compilation tape with the original demo versions of the songs, titled "Go to Hell - Demo(n)s - 1985-1987" was released by RAW Metal (Metal On Metal Records division) for the most die-hard maniacs (limited to 20 copies only). On the 28th October 2011 the "Go to Hell" release show was performed at "Kupferdächle" in Pforzheim. It was on the 21st November 2011 when Torsten M. "The Son of Death" was kicked out of the band, because he wasn't able to meet the band's expectations. Many months passed by while the band was looking for a new bass player. It was on the 27th February 2012 when Raffa G. "The Fall of Wisdom" joined OUTRAGE. With his remarkable bass playing he brought fresh air into the band and it didn't take long until Udo F. "The Bringer of Doom" declared him as the best bass guitar player the band ever had. The songwriting for the next album continued, and the recording sessions in the InnerEar studio in Pforzheim took place between August 2012 and August 2013. Meanwhile, in December 2012, RAW Metal (Metal On Metal Records division) released on cassette their favourite OUTRAGE titles: "7 Is One Take One" full-length and "Tales of Counted Sorrows" EP, both from 2006, under the collective title "7 Is 1 and Other Tales". This time the release was on pro-tape format, limited to 66 copies only. In 2012 and 2013 OUTRAGE played a few shows in Germany, and on January 4th 2014 they played their first gig abroad, in Tilburg, Netherlands. The band's 7th full-length CD titled "We the Dead" finally sees the light of day on April 25th 2014. It brings mostly new songs but the style is definitely not new. 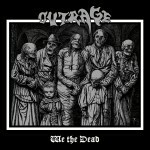 OUTRAGE have developed their own personal style making them stand out not only from the bands of the early/mid '80s but also from many contemporary black/thrash bands. The album also features new versions of one song ("Death from Behind") from their 1st demo from 1985, one song ("Delos") from their 2nd demo from 1985, and one song ("Spherical") from their 4th demo from 1987. Video clips for 2 songs off the album "Chastiser" and "We the Dead" were produced and filmed by Benedikt H. at Backyard Studio. After the release of "We the Dead", several concerts followed. In April 2014 OUTRAGE played in Eppingen, in May 2014 at "Rebtownrock" in Haltingen, close to the Swiss border, and in October a special Halloween show in Neukirchen, but before that an important festival appearance happened. In October 2014 OUTRAGE flew to Malta for the first time to play at the Malta Doom Metal Festival, where they shared the stage with MANILLA ROAD, FORSAKEN, OFFICIUM TRISTE, DESOLATION ANGELS, IN AEVUM AGERE, CRIMSON DAWN and others. In 2015 more shows followed: in Tilburg in the Netherlands together with PENTACLE and HERETIC, in July at the Metal Magic Festival in Denmark, together with bands like CANDLEMASS, GRIM REAPER, GIRLSCHOOL, SIGH, ATLANTEAN KODEX, ARKHAM WITCH, OCCVLTA, SODOMIZER, SLAUGHTER MESSIAH, HORACLE, TERMINUS, WASTED and many more, followed by Ramrod Metal Night at a biker club in Hessen. In the meantime, the band's first two demos from 1985 were remastered from the original tapes at Toxic Basement Studio, Italy, and released on vinyl by Ripping Storm Records as "1985 Demo(n)s". In May 2016, OUTRAGE played in Oberndorf at Metalheadz Open Air Festival together with MANILLA ROAD, ASHBURY, WITCHBURNER, DELIRIUM TREMENS, AIR RAID, EVIL INVADERS, ALPHA TIGER and others, and a few months later, at Sakrema club in their hometown, Pforzheim. Two months earlier, Udo F. "The Bringer of Doom" and Yannick A. "The Holder of Chaos" started the pre-production for the next album (the first recordings had already commenced months before). After several rehearsals, in April 2016, Udo F. entered again the InnerEar studio in order to record the guitar tracks, solos and special guitar effects. Raffa G. "The Fall of Wisdom" recorded his bass guitar lines and Frank P. "The Voice of Hell" laid down the vocals in June. Then a very long period of mixing and experimenting followed for Udo F. and the sound engineer Thomas M. at the InnerEar Studio in Pforzheim. The final mix was done in January 2017. Raffa G. "The Fall of Wisdom" left the band at the end of 2016 for personal reasons. Sebastian F. "The Son of Blood” helped them out for some months and also acted in the "And the Bedlam Broke Loose" video clip, which was again filmed and produced by Benedikt H. from Backyard Studio. It was only some months later, in March 2017, when Raffa G. "The Fall of Wisdom" returned to the fold. Sebastian F. "The Son of Blood" still co-operates with the band in the background. 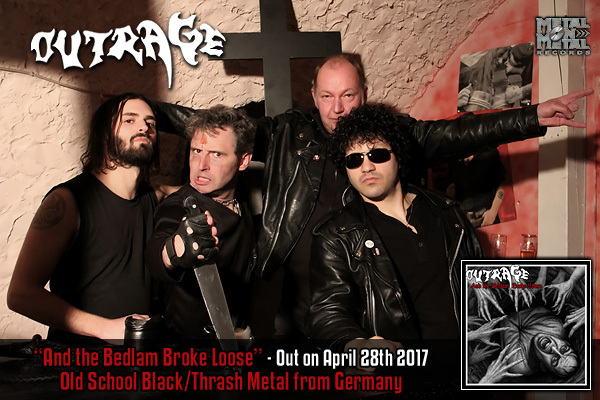 On April 29th 2017 the new album "And the Bedlam Broke Loose" was released by Metal On Metal Records. The release gig followed in June 2017 at “Sakrema” in their hometown Pforzheim. The beast is still breathing and ready to show the world what in the early/mid '80s was called Black Metal! Authentic, raw and ripping old school blackened thrash! German blackened thrash metal merchants OUTRAGE were there when the first wave of black metal was born. Having contributed to it with their 4 demos, they split to return in 2004. "We the Dead" is their 7th full-length offering and a really rare case, as it's not common that new songs not only reach the level but surpass the stuff written by bands in the '80s. While in their early days they could easily be compared to bands like SODOM, HELLHAMMER, CELTIC FROST, VENOM or BULLDOZER, now the similarities are less obvious, as their style developed becoming more and more personal, mostly because of the guitar tone and vocals. It's still raw and primeval, and there's a sense of urgency in their music the but it's not always uptempo; some songs are almost doomy. The atmosphere has some underlying Middle Eastern feel to it... it's like the hot and spine-chilling breath of some ancient Evil on your neck... Frank "The Voice of Hell" has this malignancy in his raspy and brute vocals that almost smells of sulfur. Enter the filthy cave of this beast, if you dare. Out from the dark past, from nightmares and myths and dank dungeons comes an infernal creature, named Outrage in 1983. Peers of the big 3 of the German thrash, they belonged to the first wave of black metal, but they never "made it", instead dwelling in the underground, shrouded in obscurity, while their name was passed on by the word-of-mouth along with 4 demo tapes. Fast forward to 2011... the beast is still breathing! The Bringer of Doom on the 6-stringed axe and the Voice of Hell himself decided to unearth their earliest songs and re-record them to spread more terror to the unexpecting victims... Some call it thrash, some call it black and others call it speed metal. I'd call it old school blackened thrash: raw, primitive, earthy. One thing is for sure: fans of HELLHAMMER, early days of SODOM, CELTIC FROST and VENOM... you need this in your collection! 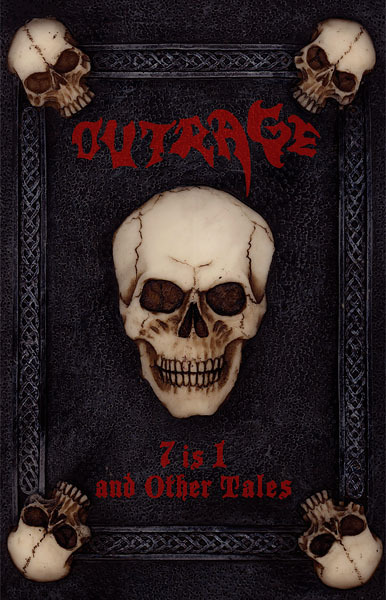 OUTRAGE "7 Is 1 and Other Tales" is a tape-only compilation release, limited to 66 hand-numbered copies. It consists of two titles the band recorded and released by themselves in 2006: full-length album "7 Is 1 Take One" and EP "Tales of Counted Sorrows". These songs show the band (formed in '83 in Germany) developing their own particular style of blackened thrash metal with a touch of doom - the compositions have more twists and less early black metal elements than their '80s material, while still staying relatively primordial. The EP is a gem on its own, being a concept album of sorts. It also features Volker "Iron Lung" F. of WARHAMMER as guest vocalist on the track "Killer".